Rashad McKee drives to the basket during Butler’s 46-45 win over Wayne on Tuesday. Bobby Cole pulls down a rebound during Butler’s 46-45 win over Wayne on Tuesday. Ronnie Hampton takes a shot during Butler’s 46-45 win over Wayne on Tuesday. Michael Kreill puts up a shot during Butler’s 46-45 win over Wayne on Tuesday. Cooper Justice drives to the basket during Butler’s 46-45 win over Wayne on Tuesday. 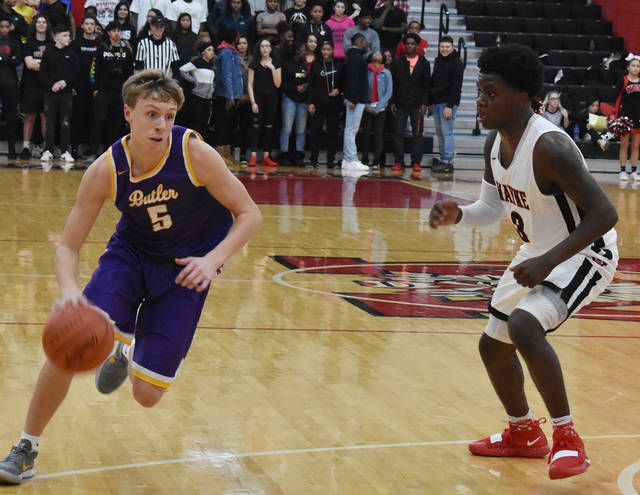 Ryan Wertz looks for room to drive baseline during Butler’s 46-45 win over Wayne on Tuesday. Quentin Glover drives the lane during Butler’s 46-45 win over Wayne on Tuesday. Bryant Johnson puts up a shot during Butler’s 46-45 win over Wayne on Tuesday. 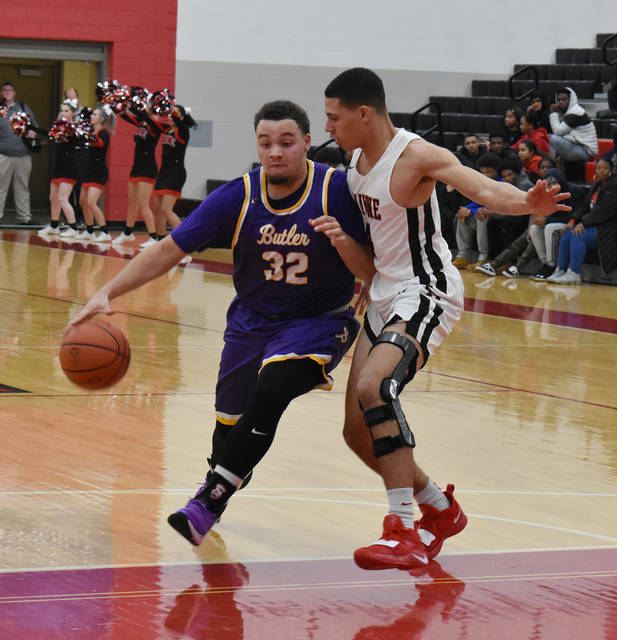 HUBER HEIGHTS — On a night where Butler’s offense sputtered for most of the game, perhaps the ending was fitting. 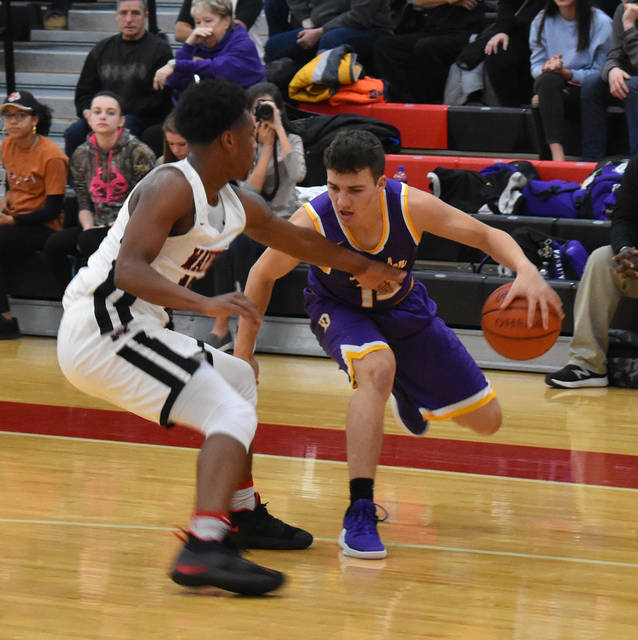 After trailing Wayne by as many as 13 points in the first half and trailing by six with 55 seconds left, the Aviators found themselves staring at a one point deficit with 8 seconds to play. Michael Kreill, Butler’s leading scorer, drove to the basket from the right side but missed the layup. 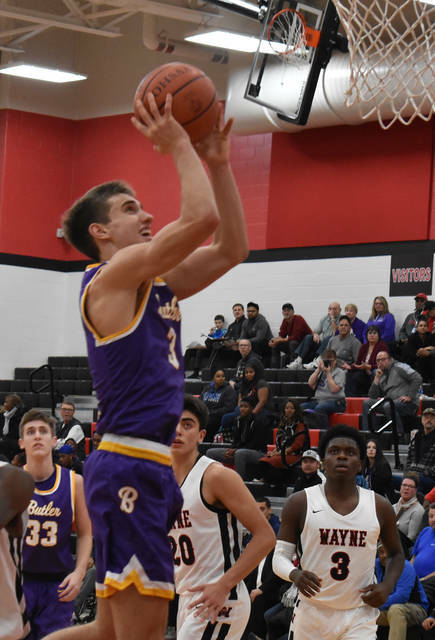 This time, though, the Aviators crashed the glass and Cooper Justice came up with the offensive rebound and drew a foul just before the buzzer. 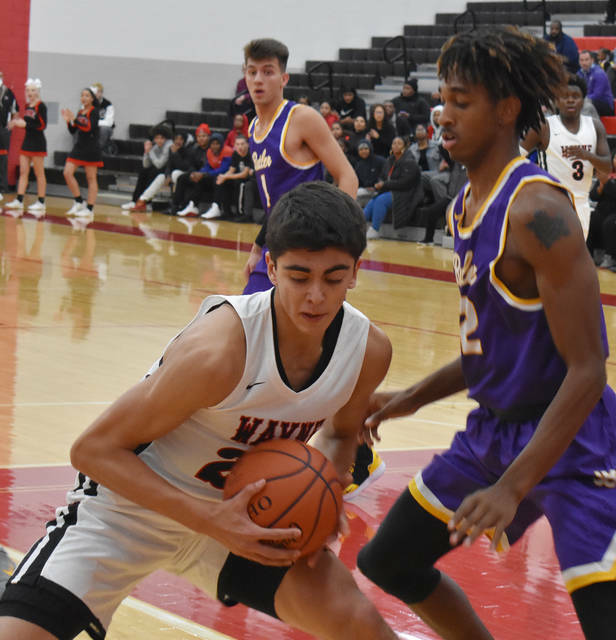 Two free throws later, and 0.4 seconds later, the Aviators found themselves with a 46-45 win that sent Wayne (1-2) reeling to their locker room. It was the first Butler (3-0) win over the Warriors since 2007. 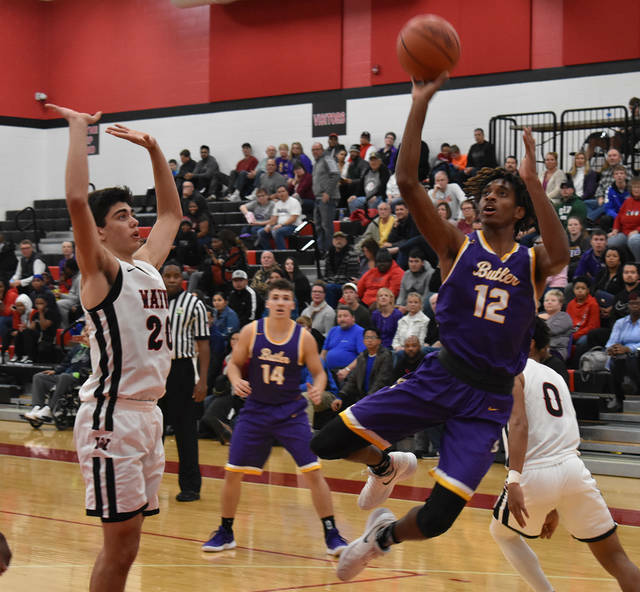 Kreill led the Aviators with 16 points while Bryant Johnson kicked in 10 and Braedon Norman had 9. Rashad McKee led the Warriors with 16 points, Tallice Landers had 9 and Ronnie Hampton scored 8. The Warriors got off to as good of a start as they could hope for. Rashad McKee opened the scoring with a layup and a three pointer while Butler missed three layups in the opening minutes. Another three by Tallice Landers and Cam Fancher pushed Wayne’s lead to 13-0. Butler finally scored its first basket with 2:34 to play in the first period and closed on a mini run to get within 15-6 to end the first quarter. 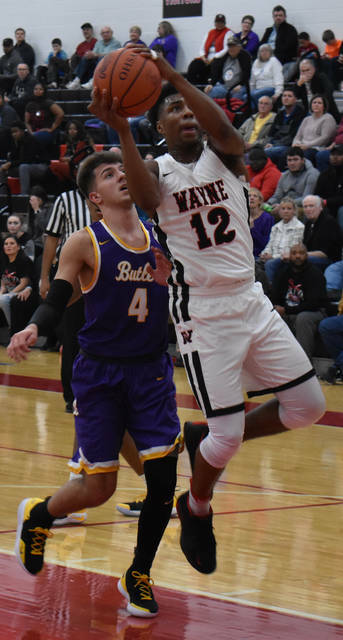 Landers scored early for Wayne and pushed the lead back to 11, but back to back hoops by Butler’s Bryant Johnson got the Aviators within 7 at 17-10. Landers and Bobby Cole answered with a pair of three-pointers to push the lead back to 11, but Butler scored the last six points of the half to limp to the locker room trailing by just 7 at 23-16. The third quarter looked to be much of the same with Ronnie Hampton, Landers, and McKee keeping the Aviators from closing the gap. But, trailing 30-20, the Aviators went on a 12-0 lead over the final three minutes of the period to take their first lead at 32-32 with 1.8 seconds left. Butler opened the fourth quarter on a 5-2 run on a three-point play and a basket by Kreill to take their largest lead at 37-32 with 6:14 to play. 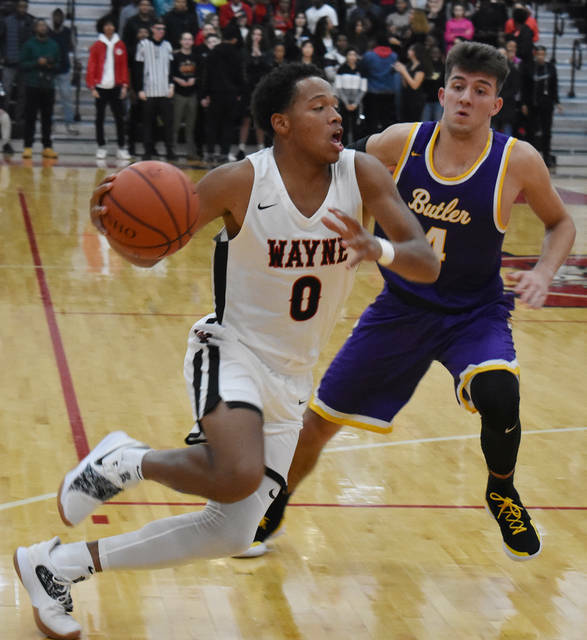 Wayne countered with a 7-0 run of their own to retake the lead on a McKee three-pointer and Butler was forced to call time with 3:14 to play. Four straight points by Hampton gave the Warriors a 45-39 lead with 55 seconds to play and it appeared the Aviator rally would fall short. Wayne made a crucial mistake with 28 seconds left by fouling a three point shooter whose shot had no chance to go in. Braedon Norman hit 2-of-3 shots to make the score 45-41. Butler started fouling, and the Warriors missed two straight front ends of a one-and-one to leave the door open. Kreill hit a three pointer with 13.1 seconds left to make the score 45-44. Another missed free throw then set up the final sequence.